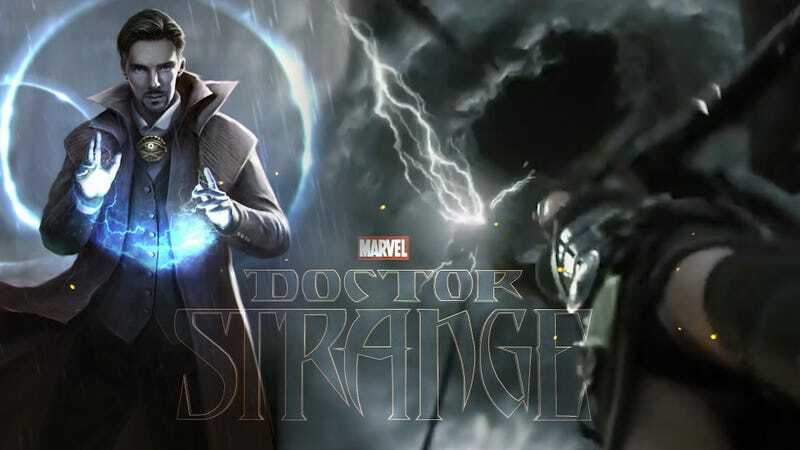 Dr. Stephen Strange has the potential to be one of the most influential new variables in the equation that is the Marvel Cinematic Universe, and with Benedict Cumberbatch having been seen filming in Nepal I thought it might be a good time to talk about The Sorcerer Supreme. Created in the 1960’s by Steve Ditko and Stan Lee, Stephen Vincent Strange first appeared in the appropriately named Strange Tales #110, a book that he would share with another Marvel hero, the Human Torch. Born in 1930 to Eugene and Beverly Strange, Steven Strange would go on to peruse a medical career after aiding his injured sister Donna and then later would become one of the worlds most gifted neurosurgeons. Like his fellow facial haired hero Tony Stark, Dr. Strange cares little about the healing power his medical training brings, but all the wealth, power, and ego it provides instead. Pride comes before the fall after all. In 1953 Strange was involved in a car accident the destroyed the majority of the nerve endings in his hands effectively ending his surgical career. Strange, too proud to take teaching or consulting positions, instead chooses to focus all his time, energy, and wealth on finding a medical cure for his hands. Strange quickly exhausts his fortune however and in a last ditch effort seeks out an old mystic named the Ancient One to try and heal his damaged nerves through, you guessed it, magic. Strange would then become the Ancient One’s apprentice and begin taking steps on the path towards assuming his eventual destiny of becoming Earth’s Sorcerer Supreme. Why is Dr. Strange so Important to the MCU? The introduction of Dr. Strange into the MCU provides something that hasn’t been all that present in any of Marvel’s films to date- Magic. Sure, we got a taste of the supernatural in Age of Ultron with Scarlet Witch but she very neatly serves as a springboard for what’s to come later in Phase 3. Let’s face it, up until now most of the heroes in the MCU deliver flashy ways to give bad guys a whollop. Iron Man has rocket boots and will punch you. Thor does use lightning but his hammer, Mjölnir, he’ll punch you with it. Hulk...smashes...that’s a version of a punch. Ant Man delivers a tiny punch that hurts like a large one. Despite her name Scarlet Witch isn’t using Magic she’s an “enhanced” which is a product of the Mind Stone in Loki’s Staff. Which, unless otherwise stated, is that weird science so advanced nobody understands it like the Asgardians. With the confirmation of the Celestials in Guardians of the Galaxy we know the Infinity Gems are merely cosmic artifacts and not magic. As for Hawkeye and Black Widow, there’s only one thing for them to do when they run out of arrows and bullets and that’s punch, punch, punch. Dr. Strange will open the door for problem solving beyond the physical. Fireballs, shields, conjured weapons, and black magic are all tricks up the Sorcerer’s sleeve. Not to mention that Earth’s sorcerers protect a group of multiverse portals called the Nexus which could be one of the key elements in getting all of the MCU’s characters to the same place. Of course this is all just speculation but it could happen, and with the new rumor floating around that Fox has given the rights to Fantastic Four back to Marvel maybe we’ll all get the Dr. Strange/Dr. Doom showdown that we didn’t know we wanted.